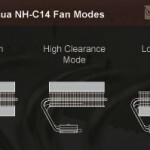 It ‘just came out the new Noctua CPU cooler called Noctua NH-C14. This is a high performance heat sink as well as generous size, but with a remarkable versatility makes it suitable for use in different situations, from Desktop PC to HTPC. As always, the packing is well done and perfect protection for the Noctua NH-C14 that are already installed in all its parts, including two huge 140mm NF-P14 FLX model. The accessories include the installation kit SecuFirm 2 for Intel and AMD (AM2, AM2 + and AM3), which greatly facilitates the task of connecting the heat sink and provides excellent grip without the risk of damaging the motherboard. 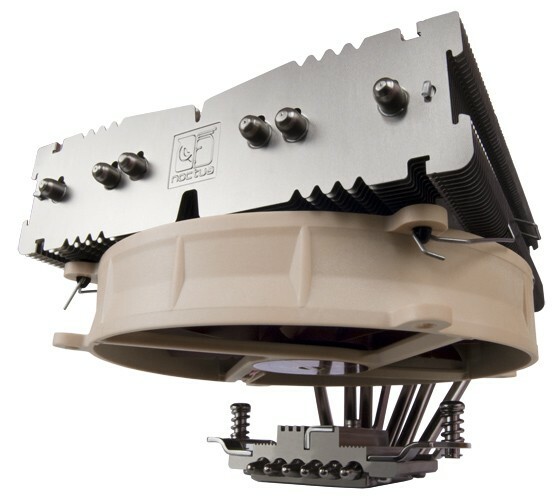 This new heatsink is already sold with the new NM-I3 mount kit that allows the SecuFirm 2 to be compatible with the new Intel socket LGA1366 LGA1156/1155 and Core and Core i7 i5 (in addition to the LGA775 socket). If you need this kit, a free upgrade is available by sending a copy of the receipt Noctua heatsink and the motherboard using the form on this page. Then there are a Y-cable to connect both fans to a single power source, two leads and two voltage transformers LNA ULNA that limit the maximum speed of rotation (useful in those systems where the fans are controlled automatically). 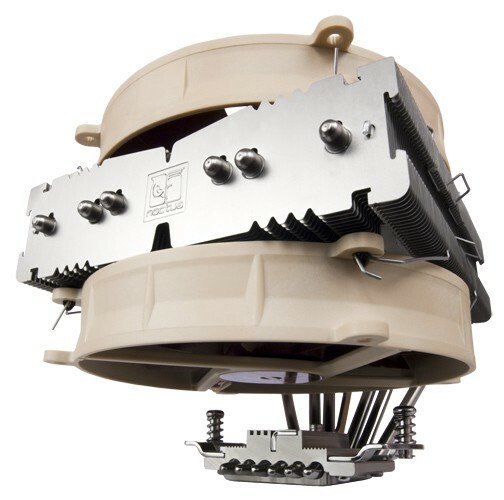 Then there are four screws and four rubber extensions for the attachment points of the fans to make them compatible with the mounting points by 14cm (that is, without them you can mount the fan NF-P14 in the most common mounting points for fans 12cm diameter). Then we have a screwdriver that allows the mounting of the heatsink and a tube of Noctua NT-H1 thermal paste. Comes complete with accessories an instruction manual in English accompanied by pictures very easy to follow. Put a lot of attention to the size of this sink because you could risk not being able to mount it! Let’s see how to best fit the Noctua NH-C14 and what options you have since the dimensions are significant, but adaptability is wide. The nickel-coated copper plate that is placed on the processor is not central to the heat sink. On the box we find a much explanation that tells us that the edge of the plate dissipation at the edge to the opposite extreme heat pipe tubes are 7.5 cm from the edge of the plate while the far end of the tubes there are 4 Heat Pipes, 5 cm. 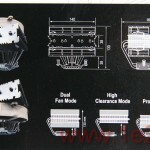 And throughout the length of the heat sink is 16.6 cm with a width of 14.5 cm. Taking into account this decentratura not exactly easy to find a suitable location could not be there at all. We must therefore take account of many things, in my case, for example, I was able to properly set the Noctua NH-C14 in one place as I was turning in the other or the video card, or the rear vent of the case or aluminum beams the case to prevent the same position. 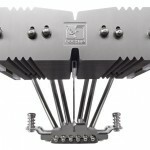 When you find enough space, the Noctua NH-C14 is perfectly suited to any other matter related to the presence of ram modules too high or too narrow homes: in fact we decide to use the NH-C14 in three different configurations: single or double fan blower, in particular by taking only the top fan in case there were other ram heatsinks on the motherboard or too high, or only by holding the lower fan in the case of installations in houses very close as noctua nh-c14negli HTPC. Already in its NH-C14 is low compared with the vertical tower heat sinks and makes it usable even in case the midi and mini. 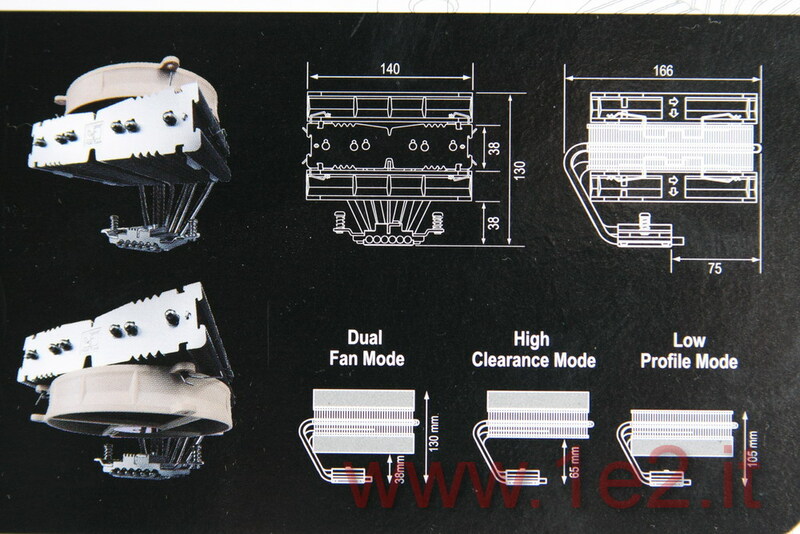 The total height is fitted with two 130mm fans, but without the top fan is 105mm. 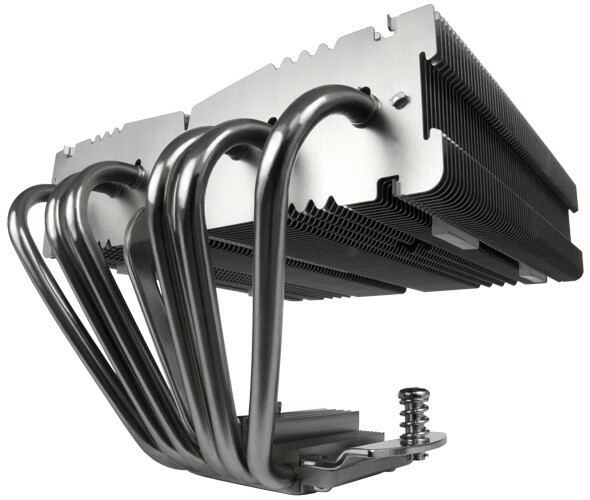 Instead of the fan base there are less than 38mm as well as for other heat sinks like the Noctua NH-U12P SE2 used for comparison, but if we remove the lower fan, keeping only the upper one, from the base to strip aluminum space allowing increased to 65mm particularly high ram modules to find their place without problems. Build quality is obviously a high level like any other product Noctua. 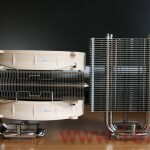 The plate dissipation is copper plated with nickel as well as 6 Heat Pipe tube 6mm. The heat sink fins are aluminum and have developed a profile that runs to the center to reduce turbulence and therefore noise. 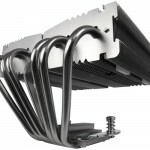 The entire block strip is supported and connected to the base of a sturdy aluminum bracket so as to avoid the heat pipe bend and be damaged. 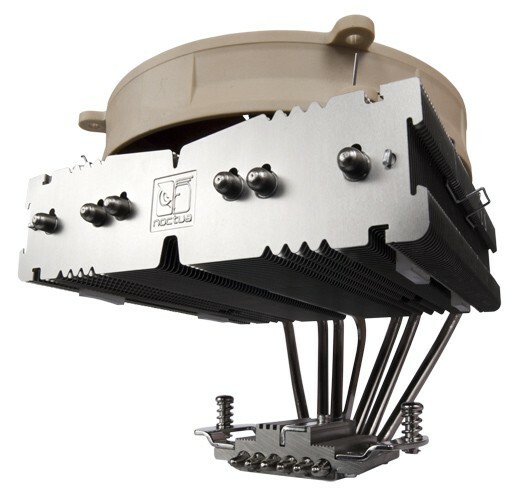 The two fan NF-P14 FLX rest on rubber pads that separate the slats and are secured to them by a quick coupling system is easy to remove or attach. Finally do not need to mount the heatsink off the fans, in fact sufficient to establish between the blades and the hole to insert a screwdriver between the blades to reach the screw. Assemble and disassemble the Noctua NH-C14 is a matter of 2 minutes! The test performed was done using a computer with an Intel E8400 overclocked to 4.07 Ghz and with no fan present in homes or on other components, however, maintained only a fan into the ultra low schemes that do not create any noise. Even as a hard disk has been used on a solid-state memory to avoid additional noise. The temperature of the test has always been monitored and maintained constant at 23.4 ° C with relative humidity of 46%. To generate the maximum heat from the CPU has been developed using the software IntelBurnTest. For comparison I wanted to limit myself to sink another house Noctua: Noctua NH-U12P the SE2. The choice of this comparison is the fact that they are two different types of heatsinks that require one space for installation is very different: one is horizontal, the NH-C14, and the other is vertical, the NH-U12P SE2. As you can see the presence of the fans 14cm in diameter that fully cover the heatsink makes the NH-C14 more powerful than the NH-U12P SE2, which uses fans instead of 12cm. We are still talking about high level of performance if we think that the processor is overclocked to 4GHz and the software used for testing is the only one able to pick up the CPU at these temperatures, in fact, in areas with normal or other stress tests The cpu never goes above 51 ° C!! Therefore interesting to note that even with one fan (either above or below) the temperature does not go beyond 64 °, taking the CPU away from excessive overheating that could damage it. It must be said then that the configuration with the horizontal heat sink, and consequently also the fans are horizontal, leads to the optimal ventilation for the components of the motherboard, the chipset to the ram. 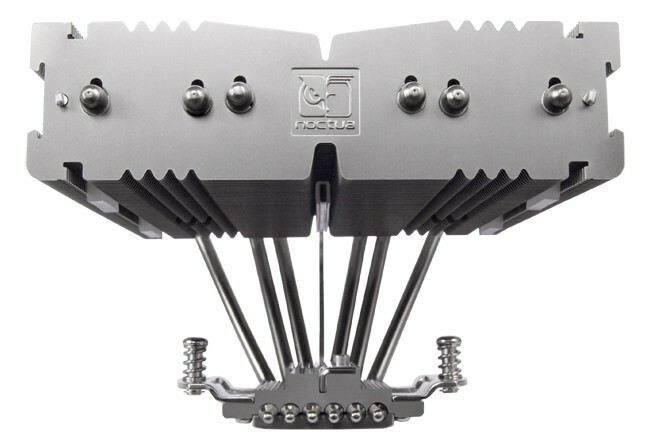 The test was made only at a speed of 600rpm fan for a reason beyond the two 800/900rpm 140mm NF-P14 FLX begin to vibrate and produce very strong oscillation of the heat sink, not so much the ‘As for the amplitude of the oscillation power due to the weight of the strips and fans. These oscillations have an impact on the whole computer vibrates to the point where you feel even the table on which was resting. Although this is in fact a solid bracket between the base and locking strip, this is not sufficient to guarantee the perfect stability. 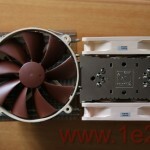 Fortunately, however, the increase in speed even at maximum fan (1250rpm) does not bring great benefits and the maximum temperature it will only fall by 2 degrees and then keep the fans at 600rpm fixed guarantees not only the absolute silence; but also an excellent heat dissipation and vibration-free enough to overclock very well motivated. 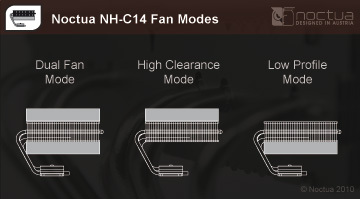 The Cooler Noctua NH-C14 is one of the best Noctua’s cooler that can give you the security of not only excellent cooling the CPU but also the motherboard itself and its major components. Besides the problem of the oscillations by increasing the speed of the fans, there’s really no reason to do it because you already have high performance 600rpm without oscillation and noise. The ability to use this sink in houses and narrow with low profile HTPC as in make it suitable for use in environments where silence is essential without sacrificing power. 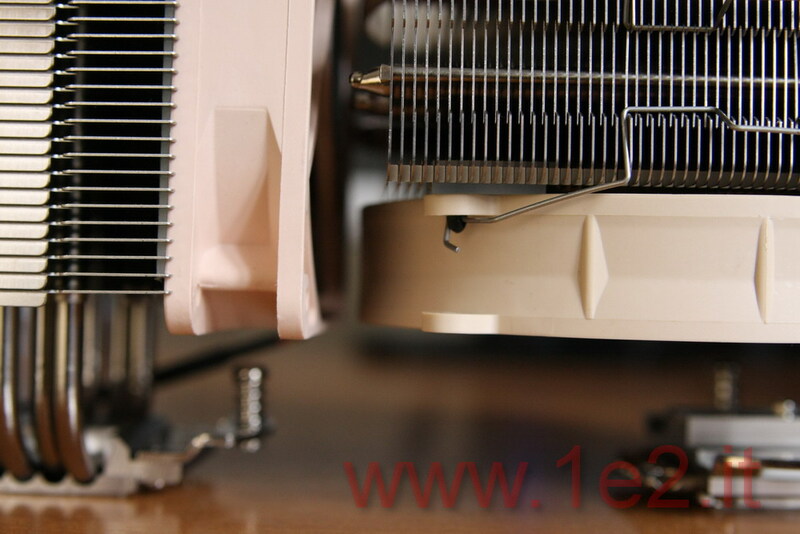 Therefore, if the height of this heatsink is not a problem, remember to check the width and length for good! Great blog.Much thanks again. Fantastic. 36 queries in 1.513 seconds. Copyright 12n3.com - AS easy AS to say 1, 2 n' 3 .com. All Rights Reserved.